I love Miami. I love the amiable mix of cultures, the scene at Hoy Como Ayer in Little Havana, the outdoor murals of Wynwood, the new South Pointe Park, the art deco homes, the new Perez Museum, built inexplicably enough on Biscayne Bay, next to new science museum under construction. Miami is a mere 77 miles from my hometown and along the same coast, so what happens in Miami isn’t going to stay in Miami. My county may be a foot or so higher in sea level, but we share the same porous limestone, the same array of barrier islands with their luxury high rises, and the same professional climate change deniers. The sense of carpe diem might have had as much to do with our choice of Miami as a destination to celebrate our 30th anniversary this past summer as the city’s many undeniable attractions. So, we treated ourselves to three nights at the Marriot on Biscayne Bay where the management – alerted to the occasion by a child – gave us an upgrade that included a sweeping view of the Bay, Causeway and cruise ships. To my surprise, this Marriot (as in West Palm Beach) is growing food on site for its restaurants. Lettuces, tomatoes and herbs are the edible landscaping by the pool area. That ‘farm to table’ glimmer aside, I am worried about Miami. It is clearly failing the test in how coastal cities will need to adapt to a rising sea. The $500 million earmarked for a new pumping system for Miami Beach is already acknowledged as a mere stopgap. I am concerned about friends there who recently spent weeks and a small fortune to install stronger new windows in their ground floor condo. I fear for the stalwart efforts to forestall what appears inevitable, even if we were able to cease using fossil fuels immediately. One of these is a permaculture food forest, right in the heart of the city, designed by Deva Marcus Thompson, founder of Permaculture Miami, whose intensive at The Mounts Botanical Garden I attended this weekend. Eve Mosher’s High Waterline project to show just how high the water will rise, is another. Also, Colony1, a sustainability research center that combines art and science. Closer to home, and heart, Transition Palm Beaches. It is uplifting to see smart, persistent media coverage on the climate crisis, e.g. 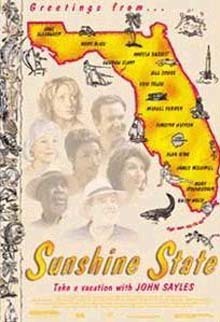 a feisty overview of what keeps The Sunshine State from becoming a solar energy giant in a blog post from Fred Grimm in The Miami Herald last Friday: Florida Utilities Stay Shady… While Florida denies, he writes, neighboring Georgia is preparing to add 900 megawatts of solar by 2016, thanks to an unlikely alliance between environmentalists and the Tea Party, aka, The Green Tea Party (the latter on free-market principles). When you realize that some $12 million has been allocated by our largest utilities to fund, “on average, one lobbyist for every two [Florida] state legislators each legislative sessions between 2007 and 2013,” you know what we are up against. The choice at the polls has never been clearer. Or the need to rid politics of money. Pitch in, please, every way you can. It sure beats relocation to … Anchorage.